Definition at line 90 of file llfloatercustomize.cpp. Definition at line 97 of file llfloatercustomize.cpp. Definition at line 98 of file llfloatercustomize.cpp. Definition at line 2484 of file llfloatercustomize.cpp. References gAgent, LLAgent::getAvatarObject(), LLViewerImage::getID(), LLViewerImageList::getImage(), LLCharacter::getSex(), LLViewerObject::getTEImage(), LLCharacter::getVisualParamWeight(), gFloaterCustomize, gImageList, gSavedSettings, i, mAppearance, LLAppearance::mParamMap, LLAppearance::mTextures, LLVisualParamHint::requestHintUpdates(), S32, LLAgent::sendAgentSetAppearance(), LLVOAvatar::setLocTexTE(), LLControlGroup::setU32(), LLCharacter::setVisualParamWeight(), SEX_MALE, LLVOAvatar::TEX_NUM_ENTRIES, TRUE, LLFloaterCustomize::updateScrollingPanelList(), LLVOAvatar::updateSexDependentLayerSets(), and LLVOAvatar::updateVisualParams(). Referenced by redo(), and undo(). Definition at line 101 of file llfloatercustomize.cpp. Definition at line 109 of file llfloatercustomize.cpp. Definition at line 2419 of file llfloatercustomize.cpp. References LLAppearance::addParam(), LLAppearance::clear(), gAgent, LLAgent::getAvatarObject(), LLCharacter::getVisualParam(), mAppearance, LLColor4::mV, param, LLVOAvatar::teToColorParams(), VX, VY, and VZ. Definition at line 2413 of file llfloatercustomize.cpp. 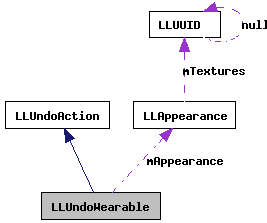 References LLAppearance::addTexture(), LLAppearance::clear(), and mAppearance. Definition at line 2407 of file llfloatercustomize.cpp. References LLAppearance::addParam(), LLAppearance::clear(), and mAppearance. Definition at line 2450 of file llfloatercustomize.cpp. References LLAppearance::addParam(), LLAppearance::addTexture(), LLAppearance::clear(), gAgent, LLAgent::getAvatarObject(), LLCharacter::getFirstVisualParam(), LLCharacter::getNextVisualParam(), LLViewerObject::getTEImage(), LLVOAvatar::getTEWearableType(), mAppearance, param, S32, LLVOAvatar::TEX_NUM_ENTRIES, and VISUAL_PARAM_GROUP_TWEAKABLE. Definition at line 108 of file llfloatercustomize.cpp. Definition at line 94 of file llfloatercustomize.cpp. Referenced by applyUndoRedo(), setColor(), setTexture(), setVisualParam(), and setWearable().